Clavulina crestata: Crested Coral Mushroom. Attractive edible. Grows under evergreens. Location: Canyon Rim Trail, Roaring Plains, MNF, WV. 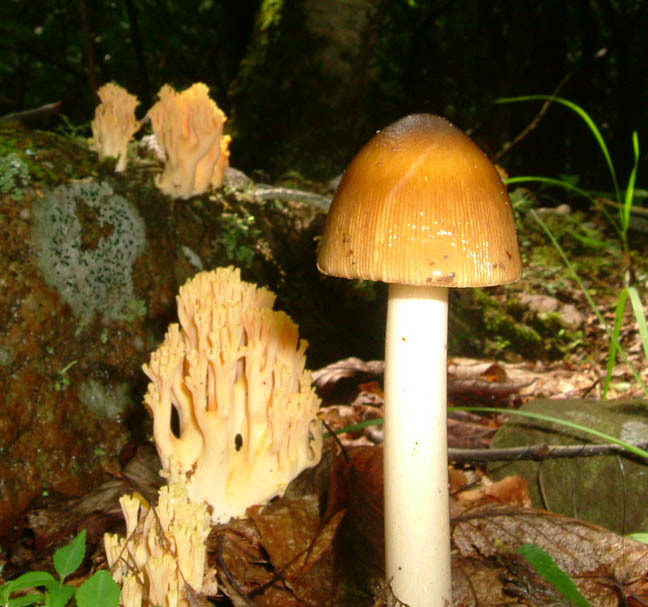 Ramaria formosa, Yellow-tipped Coral w/Amanita fulva: Grows on the ground under conifers. Can get quite large. Poisonous! Location: Seneca Creek Tr, MNF, WV. Photo by Jim Kirk. Ramaria stricta: straight-branched Coral. Location: Gunpowder Loop Trail above Hemlock Gorge, MD. Photo by Ken Clark. 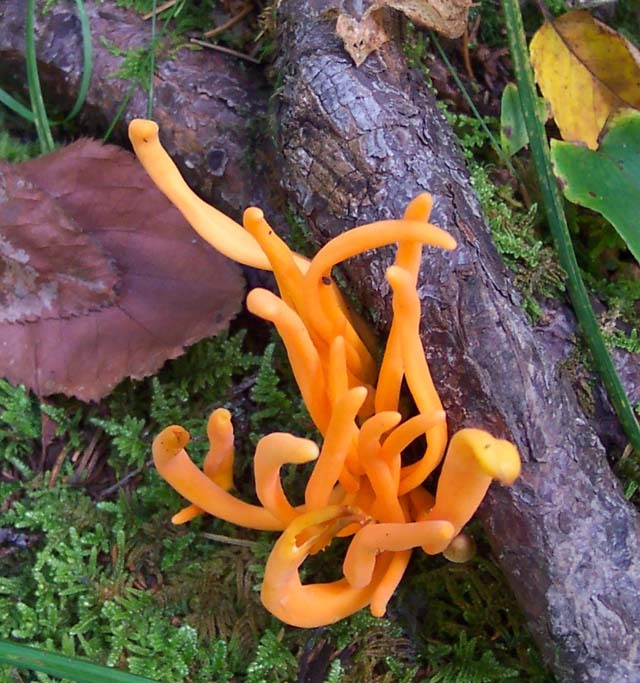 Clublike Tuning Fork (Calocera cornea): Very small. Less than 3/4 inch. Unlike its larger cousin it is usually unforked. Location: Middle Patuxent River, MD. Photo by Ken Clark. Tremellodendron pallidium, Jellied False Coral: Grows under plants in moist forests. Location: Overall Run Trail, SNP, VA.
Red Raspberry Slime (Tubifera ferruginosa) w/Flat-backed Millipedes: Actually a coral mushroom and not a slime. 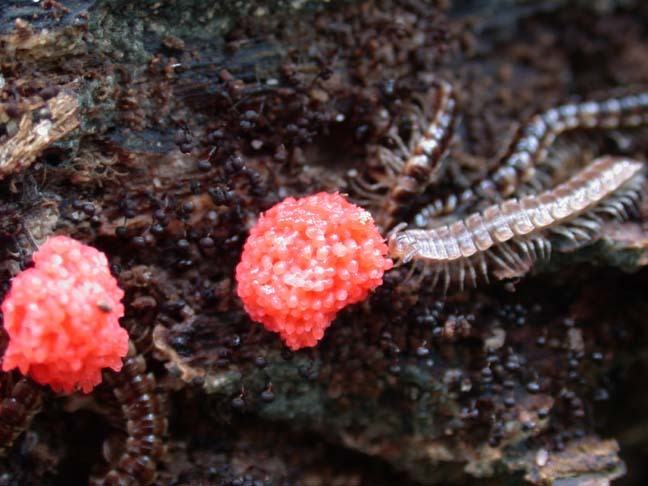 The red, translucent bodies give way to brown cigar-shaped stalks with age. Photo by Ken Clark. 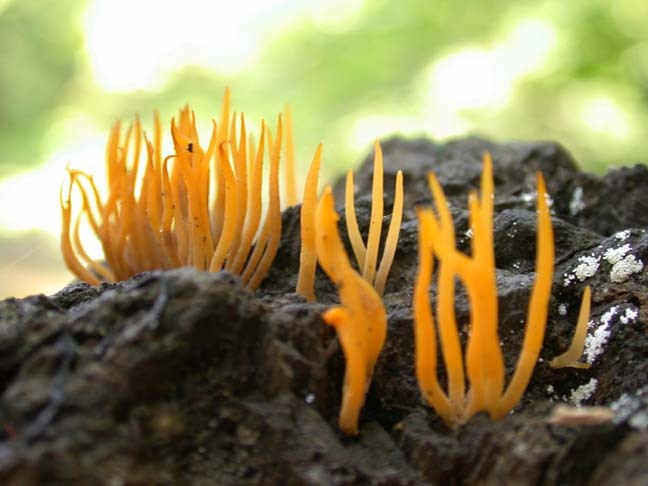 Clavulinopsis aurantiocinnabarina, Orange Spindle Coral: Similar to its yellow cousin, fusiformis. Location: South Prong Tr, MNF, WV. 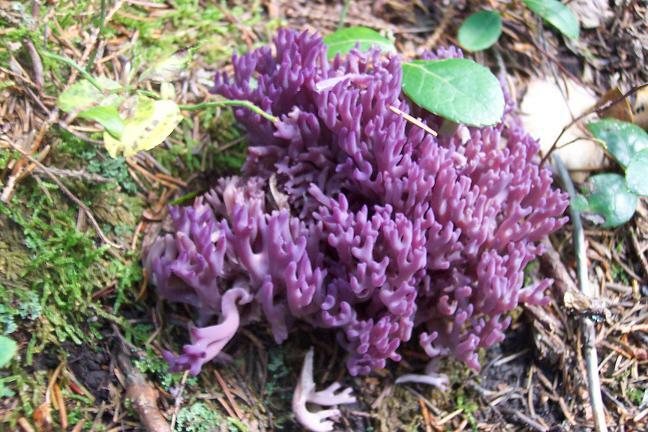 Clavulina amethystina, Violet-branched Coral: Edible. Season: July/Sept. Location: South Prong Tr, MNF, WV. Clavulinopsis fusiformis: Yellow Spindle Coral. 1 to 2 inches in height. 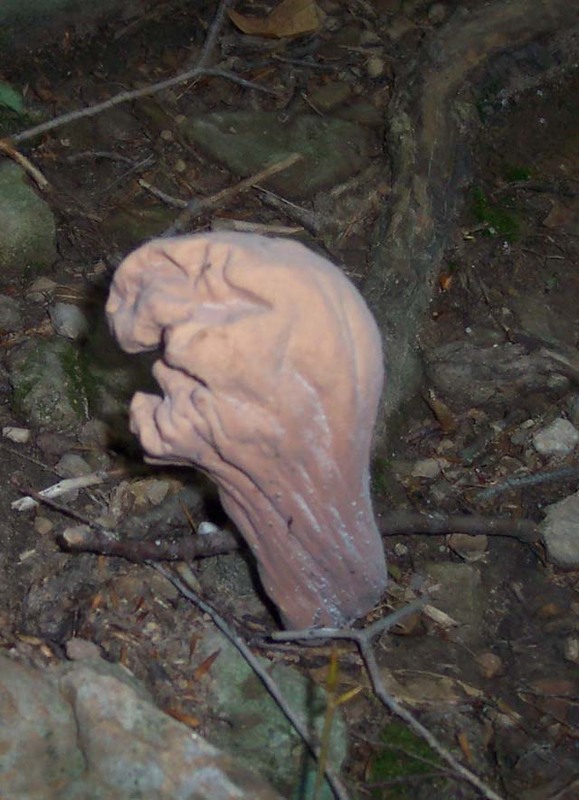 Location: Bull Run Mt Conservancy, VA.
Clavariadelphus pistillaris, Pestle-shaped Coral: This species can grow up to 12 inches tall. Turns brown when bruised. Edible but unpalatable. Location: Boar's Nest Tr, MNF, WV.